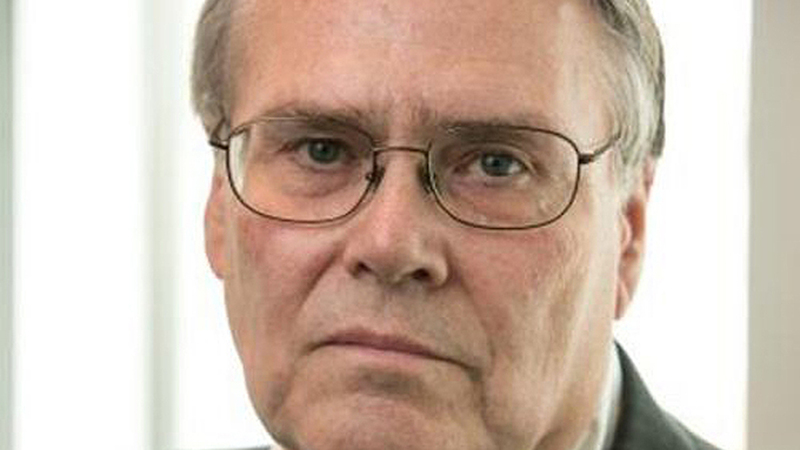 Traffic is down in week four—giving AAR Senior Vice President Policy and Economics John T. Gray reason not to smile. Still, for the month of January, it’s up overall—which is reason to smile! 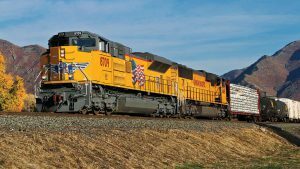 U.S. rail traffic for the week ending Jan. 26, 2019 dipped a bit, the Association of American Railroads (AAR) reported on Jan. 30. But for the month of January, it registered a nice gain over the prior-year period. For the week, total U.S. weekly rail traffic was 522,026 carloads and intermodal units, down 4% compared with the same week last year. Total carloads for the week ending Jan. 26 were 248,937 carloads, down 4.7% compared with the same week in 2018, while U.S. weekly intermodal volume was 273,089 containers and trailers, down 3.3% compared to 2018. Two of the 10 carload commodity groups posted an increase compared with the same week in 2018. 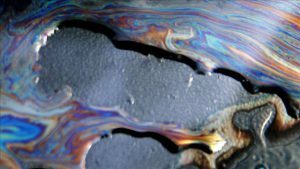 They were petroleum and petroleum products, up 2,121 carloads, to 13,627; and chemicals, up 297 carloads, to 31,190. 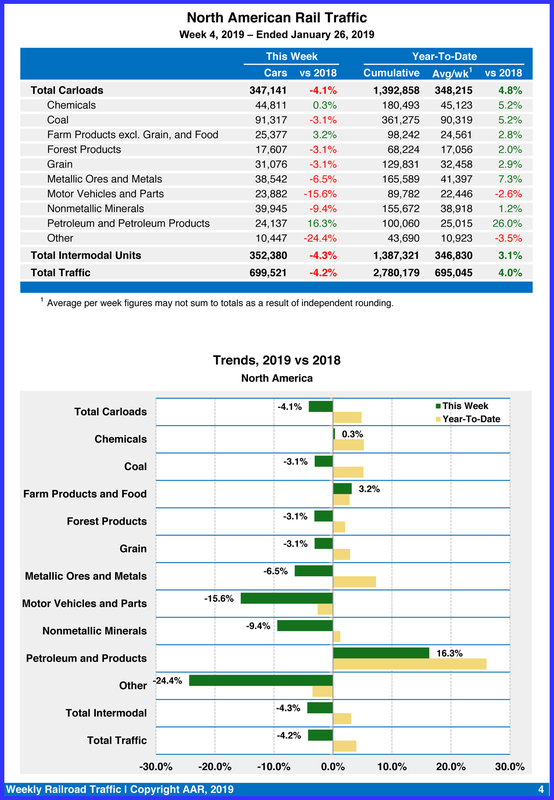 Commodity groups that posted decreases compared with the same week in 2018 included coal, down 4,400 carloads, to 82,471; miscellaneous carloads, down 2,695 carloads, to 8,246; and nonmetallic minerals, down 2,503 carloads, to 30,172. For the first four weeks of 2019, U.S. railroads reported cumulative volume of 995,769 carloads, up 4.6% from the same point last year; and 1,060,598 intermodal units, up 3.2% from last year. 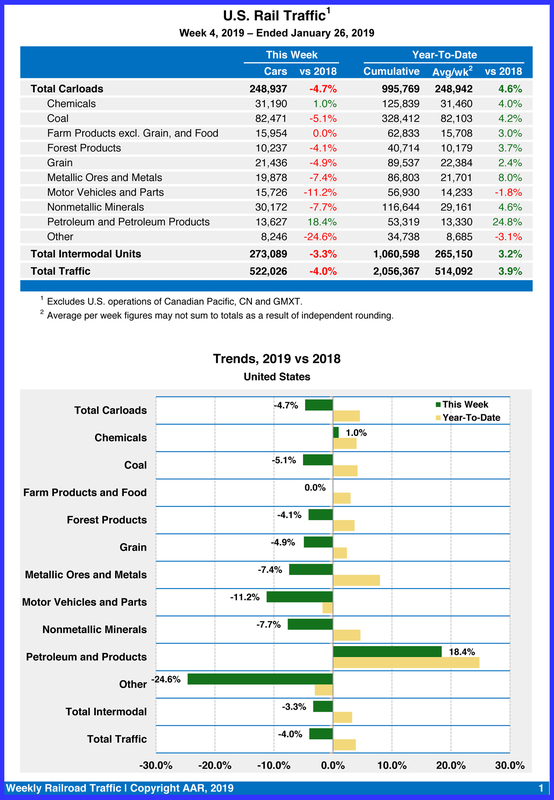 Total combined U.S. traffic for the first four weeks of 2019 was 2,056,367 carloads and intermodal units, an increase of 3.9% compared to last year. North American rail volume for the week ending January 26, 2019, on 12 reporting U.S., Canadian and Mexican railroads totaled 347,141 carloads, down 4.1% compared with the same week last year, and 352,380 intermodal units, down 4.3% compared with last year. 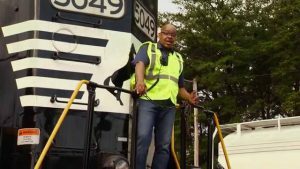 Total combined weekly rail traffic in North America was 699,521 carloads and intermodal units, down 4.2%. North American rail volume for the first four weeks of 2019 was 2,780,179 carloads and intermodal units, up 4% compared with 2018. 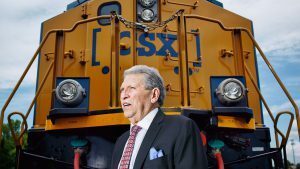 Canadian railroads reported 80,560 carloads for the week, up 2.2%, and 66,650 intermodal units, down 1.1% compared with the same week in 2018. For the first four weeks of 2019, Canadian railroads reported cumulative rail traffic volume of 590,626 carloads, containers and trailers, up 8.3%. Mexican railroads reported 17,644 carloads for the week, down 19.3% compared with the same week last year, and 12,641 intermodal units, down 31.5%. 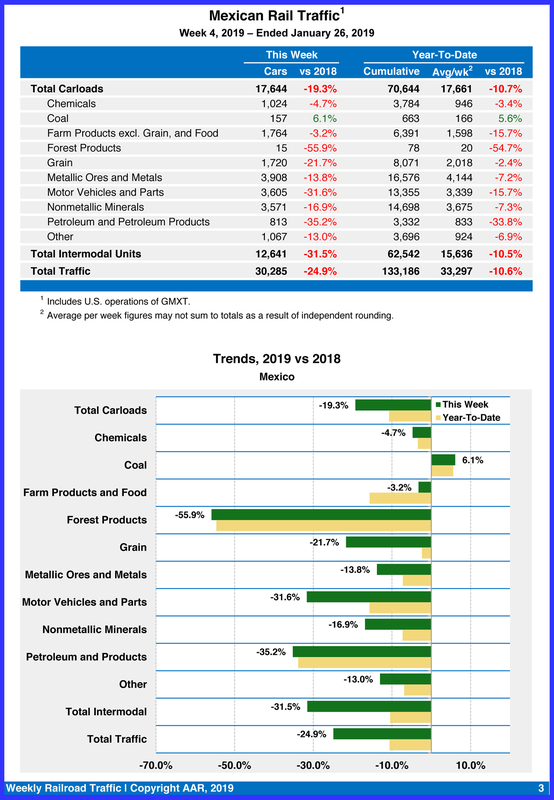 Cumulative volume on Mexican railroads for the first four weeks of 2019 was 133,186 carloads and intermodal containers and trailers, down 10.6% from the same point last year.